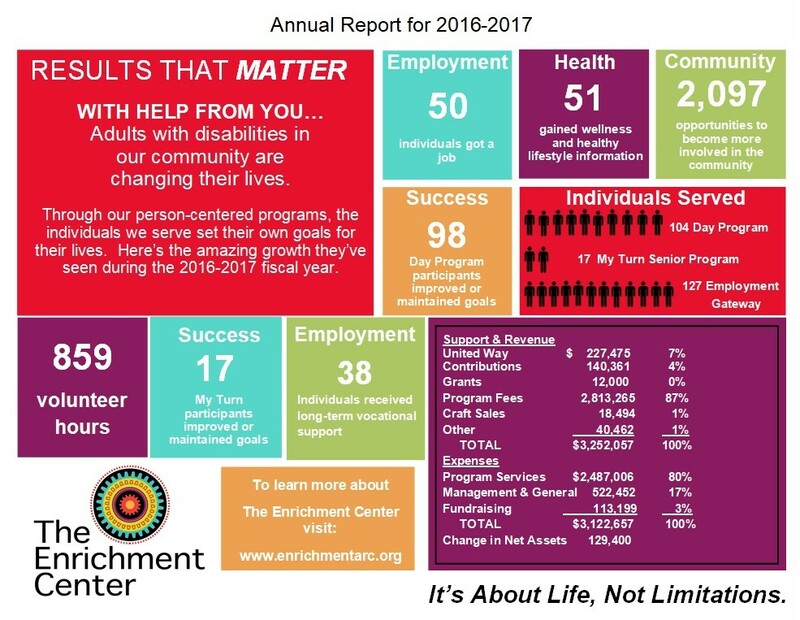 The Enrichment Center helps adults with intellectual and developmental disabilities reach their full potential and achieve their best life. Through art classes, life skills training, community activities and job placement, individuals build on their abilities and connect to the broader community. These efforts enrich their lives, and the life of our community through their inclusion. Many individuals progress to a level of independence and success that would otherwise be unimaginable. 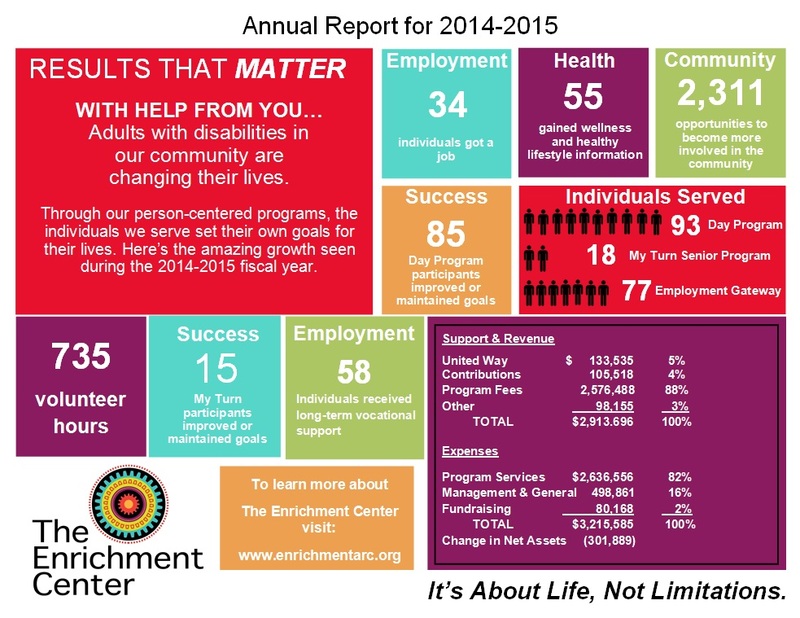 Founded in 1983 by a group of concerned parents to create a continuous learning environment for their adult children with life-long intellectual and developmental disabilities, The Enrichment Center is an affiliated chapter of The Arc. Currently, The Enrichment Center serves more than 200 local individuals and their families, empowering them through art, education and employment. In our Day Program, My Turn Senior Program and Employment Gateway, The Enrichment Center provides the following Innovations Waiver and B3 Waiver services: Day Supports (individual and group), Community Living Supports, Community Networking, Respite Care (individual and group), Supported Employment, Long Term Vocational Supports, Human Resource Development and services contracted with Vocational Rehabilitation such as job development and job coaching. Please visit our Events page to learn more about what's happening at The Enrichment Center. Go here for our annual Holiday and Professional Training Day calendar. Our mission is to empower and enrich adults with intellectual and developmental disabilities enabling them to grow as individuals, live with dignity and have choices in how they fulfill their lives. Our vision is to see every person with an Intellectual/Developmental disability in our community live the best life for them. We believe that people with intellectual and developmental disabilities are defined by their own strengths, abilities, and inherent value – not by their disability. We believe that people with intellectual and developmental disabilities are entitled to the respect, dignity, equality, safety, and securities accorded to other members of society and are equal before the law. We believe that society benefits from the contributions of people with diverse personal characteristics (including but not limited to race, ethnicity, religion, age, geographic location, sexual orientation, gender and type of disability). The Enrichment Center is accredited by CARF International (the Commission on Accreditation of Rehabilitation Facilities). The Enrichment Center is the 1992 winner of the Joel and Claudette Weston Award for Excellence in Nonprofit Management.